Inside the Central Cardamom Protected Forest CCPF) in Koh Kong Province. 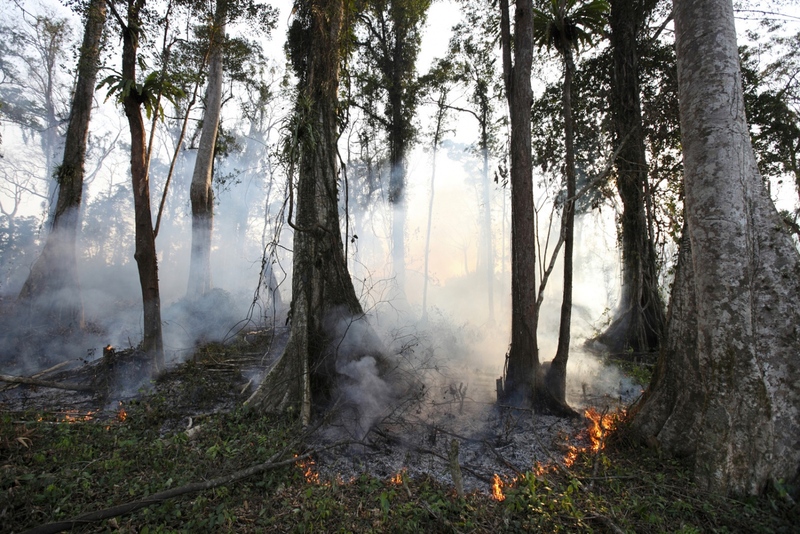 A large area of forest is logged and burnt down to make way for a banana plantation. Such actions are often encouraged by a poorly implemented Government project to give people land titles has led to massive deforestation as people claim areas of forest as their own land. Chinese engineers from Sinohydro prepare to leave for a day of work in the Arena Valley on the back of local's motorbikes to assess the feasibility of the 108 megawatt Cheay Areng Dam. A traditional funeral service follows the death of an old lady in a village in the Areng Valley. This village along with 8 others were at risk of disappearing because of the 108 megawatt Cheay Areng Dam. The project will wipe out the world's largest remaining wild population of Siamese crocodiles and destroy more than 20,000 hectares of the Central Cardamom Protected Forest (CCPF), which is critical habitat for 31 endangered animal species including the Asian Elephant. 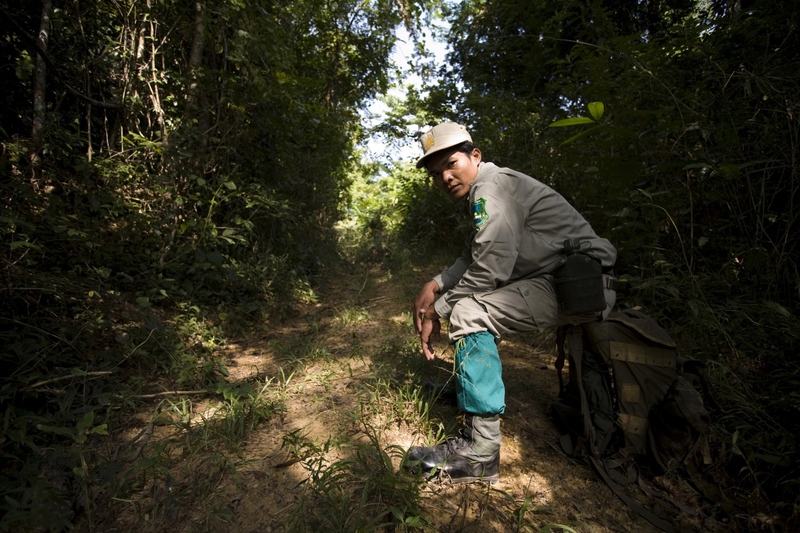 A Cambodian soldier secures the road leading through the forest during a raid on some illegal sassafras oil distilleries. Sassafras distilleries that produce the oil from rare Mreah Prew Phnom trees have become a real problem in this area but difficult to stop due to the remoteness of the forest and the high demand and profitablility as the oil can be used as an ingredient for the drug Ecstasy. Loading up the passenger boat to get to the remote village of Prek Svey in the Central Cardamom Protected Forest area of Koh Kong Province. Around 2000 after being declared extinct in the wild the Siamese Crocodile was 're-discovered' in the remote Cardamon Region. Then in June 2010 a nest of eggs was found by a team run by Fauna and Floras International (FFI), a British NGO. 15 eggs were taken to safety and 10 successfully hatched in a 'fake' nest guarded by FFI staff. Since that 2000 discovery much work has been done to find and research this critically endangered reptile. It is now believed that around 250 Siamese Crocodile are alive in the wild, the majority of which are in the Cardamon Mountains, down from tens of thousands before man started hunting them and encroaching on their habitat. After successfully doing DNA tests to find 'pure blood' Siamese Crocs rather than those who have been cross-bred they plan to work with a breeding centre that will lead to the crocodiles being released back in to the wild. 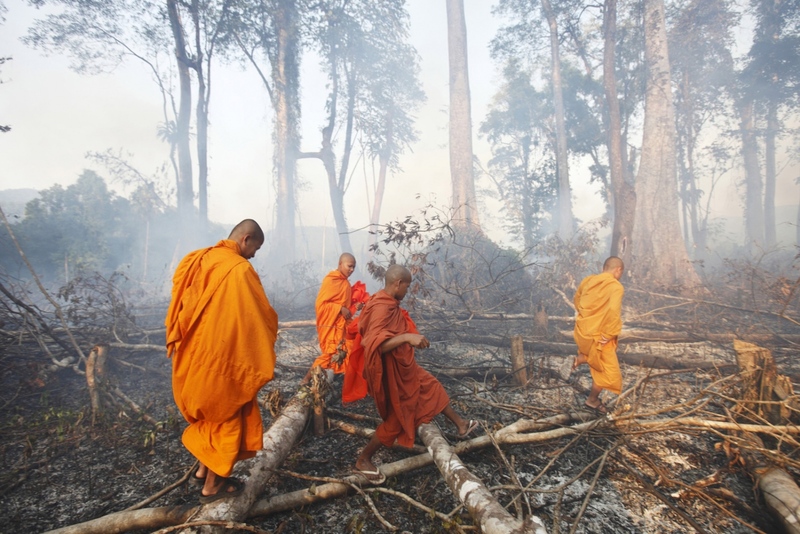 Cambodian Buddhist monks walk through a burning forest. 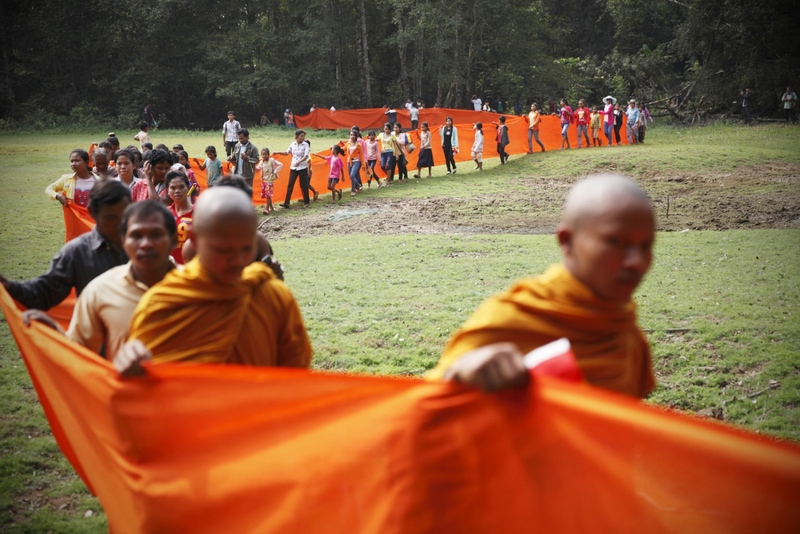 Following uncontrolled forest destruction in the Central Cardamom Protected Forest (CCPF) an eco-warrior monk movement has begun whereby monks and villagers try to protect areas of forest by blessing trees to deter would-be loggers. This was the first tree ordination in a forest area on the edge of Ta Tay Leu village that has just been cleared to make-way for a banana plantation. Whilst they were too late to save the smaller trees they were able to bless and tie orange material around the remaining large trees. 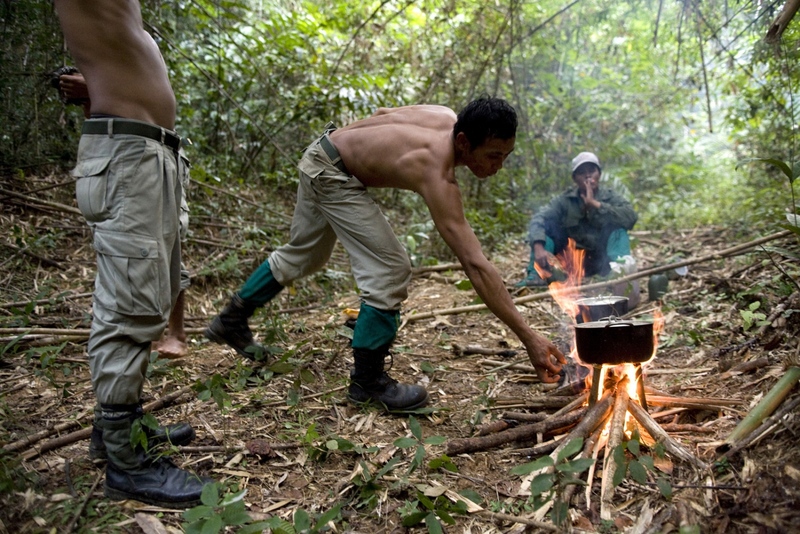 Rangers make a camp whilst on patrol in the forest. The forest rangers are employed by the Ministry of Environment but sponsored by Flora and Fauna International who pays them 75% of their salary and provides training and accommodation. 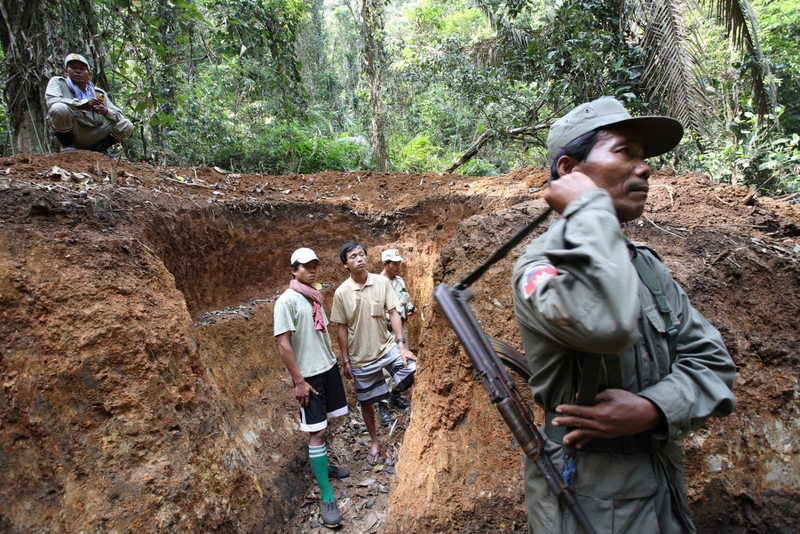 They undertake regular patrols in to the Samkos Wildlife Sancturary which is part of the Cardamom Mountains Nature Reserve looking for illegal activites such as logging, poaching, land encroachment and the production of the illegal substance sassafras oil. 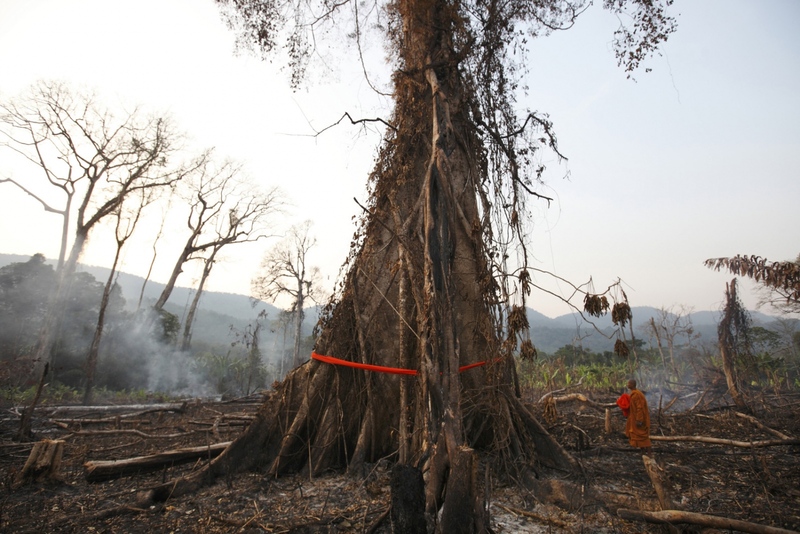 A Cambodian Buddhist monk blesses a large tree by wrapping orange cloth around it and praying. Following uncontrolled forest destruction in the Central Cardamom Protected Forest (CCPF) an eco-warrior monk movement has begun whereby monks and villagers try to protect areas of forest by blessing trees to deter would-be loggers. Locals hunt for fish with a homemade harpoon gun in the Areng River in the Areng Valley. The river is the one that will be dammed by the 108 megawatt Cheay Areng Dam. 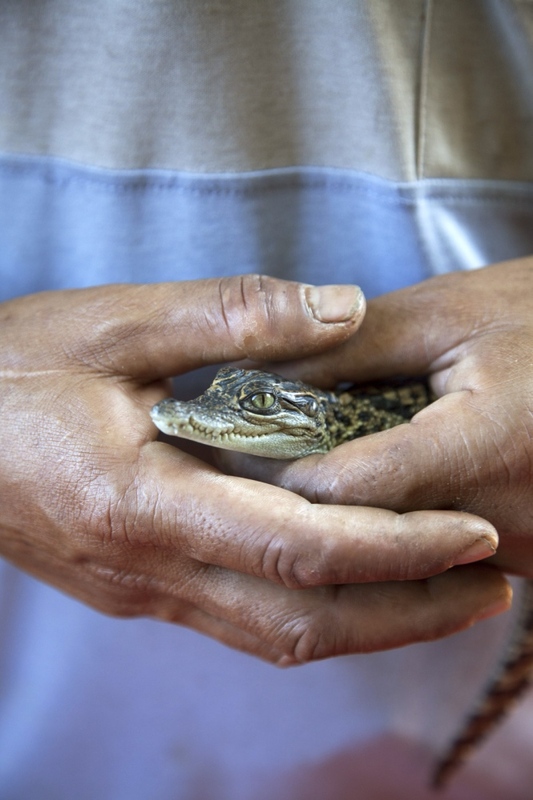 The project will wipe out the world's largest remaining wild population of Siamese crocodiles and destroy more than 20,000 hectares of the Central Cardamom Protected Forest (CCPF), which is critical habitat for 31 endangered animal species including the Asian Elephant. Cambodian Buddhist monka bless large trees by wrapping orange cloth around it and praying. Following uncontrolled forest destruction in the Central Cardamom Protected Forest (CCPF) an eco-warrior monk movement has begun whereby monks and villagers try to protect areas of forest by blessing trees to deter would-be loggers. Son Piseth, the Programme Officer for the Cambodian Crocodile Conservation Programme and expert crocodile hunter hides from the rain under a poncho in a tropical downpour after visiting the nest where the Siamese crocodile eggs were found. 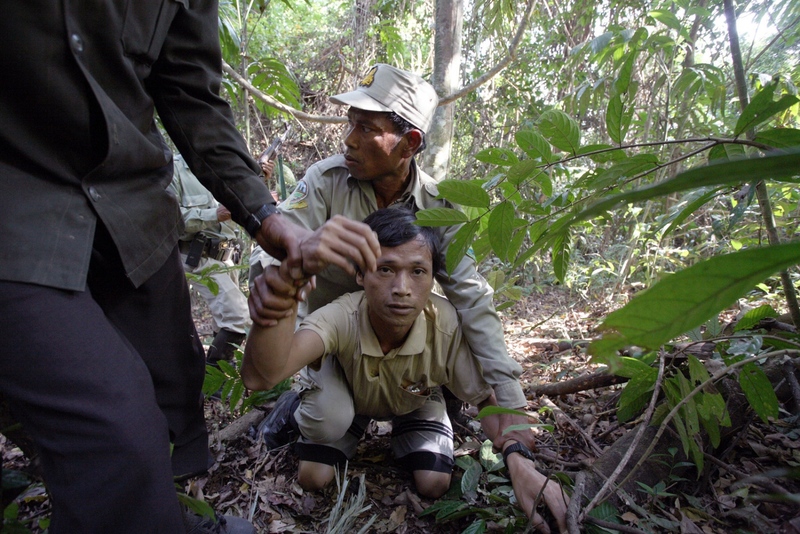 Whilst on a patrol a group comprising of park rangers and Cambodian soldiers catch a worker of an illegal sassafras oil distillery. He is a Vietnamese national sent to work here from Phnom Penh. After being pinned to the ground, he is searched and hand-cuffed. Sassafras distilleries that produce the oil from rare Mreah Prew Phnom trees have become a real problem in this area but difficult to stop due to the remoteness of the forest and the high demand and profitablility as the oil can be used as an ingredient for the drug Ecstasy. 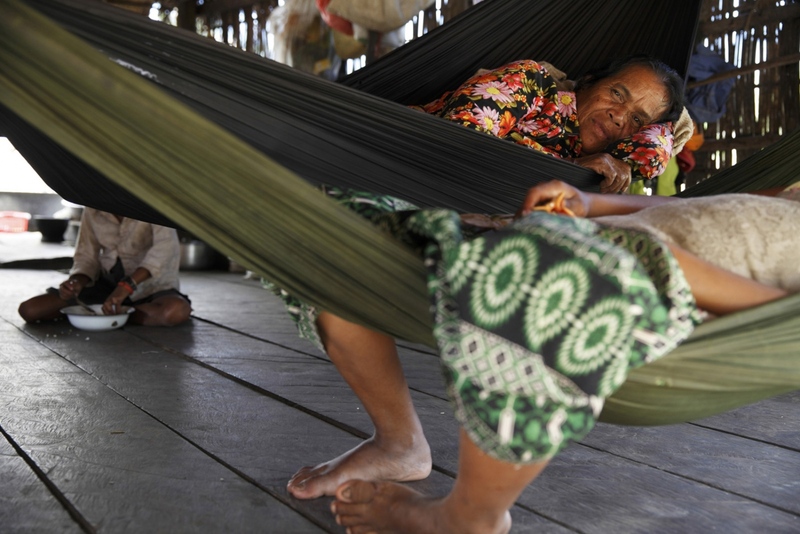 A grandmother and granddaughter rest in hammocks in a house in a village in the Areng Valley of Koh Kong Province. 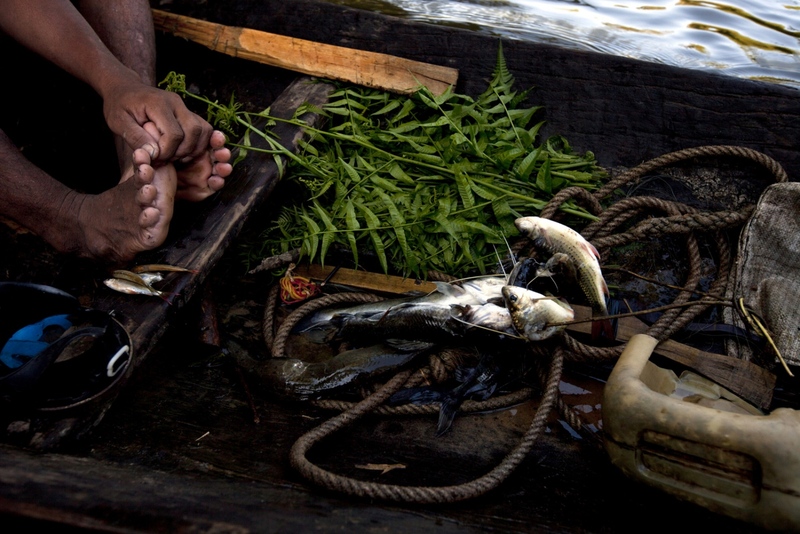 Fishermen with their catch on the Areng River in Koh Kong Province. Som Khut, a community warden for the Cambodian Crocodile Conservation Programme and the one looking after the hatchlings at his house. Here he stands with his daughter holding some of the Siamese Crocodile babies. Two captured workers of an illegal sassafras oil distillery, one Vietnamese and one Cambodian, are made to stand hand-cuffed together and under guard in the hole they helped to dig. Sassafras distilleries that produce the oil from rare Mreah Prew Phnom trees have become a real problem in this area but difficult to stop due to the remoteness of the forest and the high demand and profitability as the oil can be used as an ingredient for the drug Ecstasy. 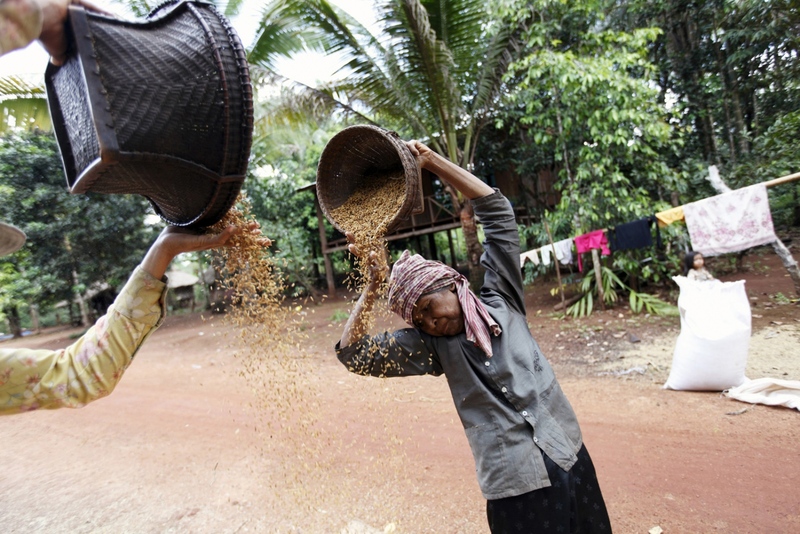 Local women clean rice by allowing the wind to blow away the husks in the Areng Valley of Koh Kong Province. 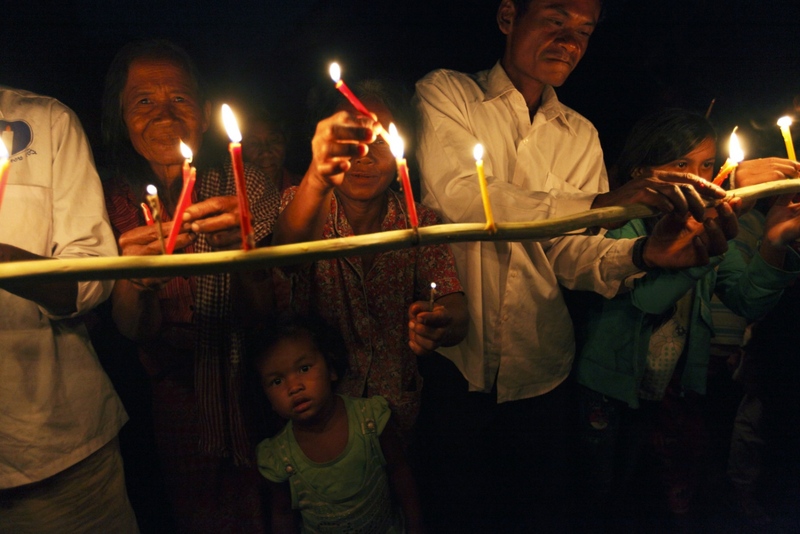 Local people of Prolay village in the Areng Valley take part in a traditional annual ceremony at their local temple. 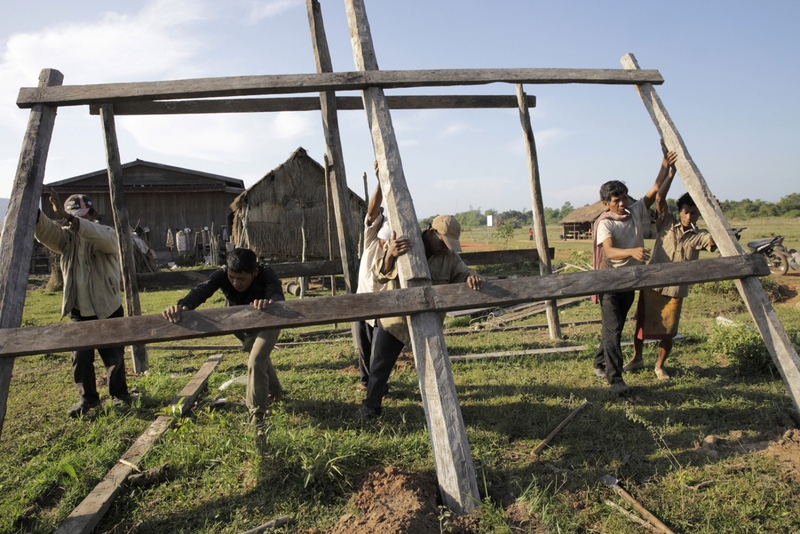 Local men assemble a simple wooden house in Prolay village in the Areng Valley. A logged tree in the Central Cardamom Protected Forest. The loggers fled. 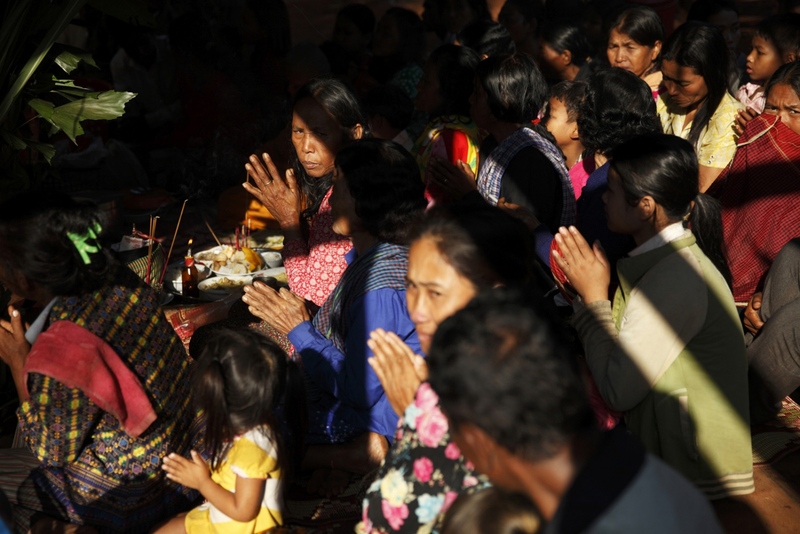 Cambodian women sit in a small shop in the Areng Valley. A ranger takes a rest whilst on patrol in the forest. The forest rangers are employed by the Ministry of Environment but sponsored by Flora and Fauna International who pays them 75% of their salary and provides training and accommodation. 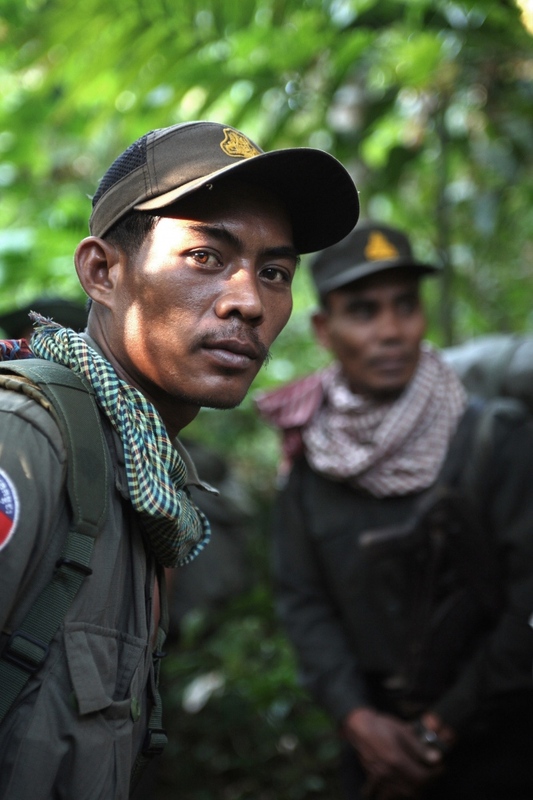 They undertake regular patrols in to the Samkos Wildlife Sancturary which is part of the Cardamom Mountains Nature Reserve looking for illegal activites such as logging, poaching, land encroachment and the production of the illegal substance sassafras oil. 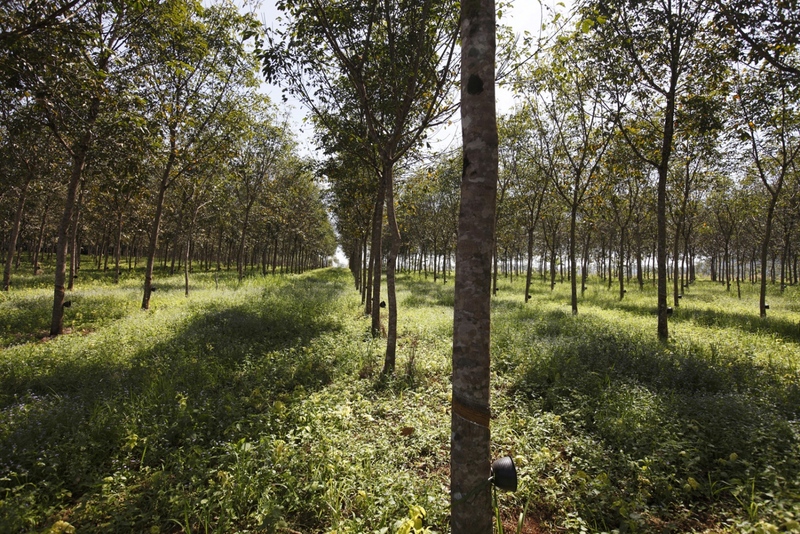 A rubber plantation built at the edge of a village in the Central Cardamom Protected Forest (CCPF). 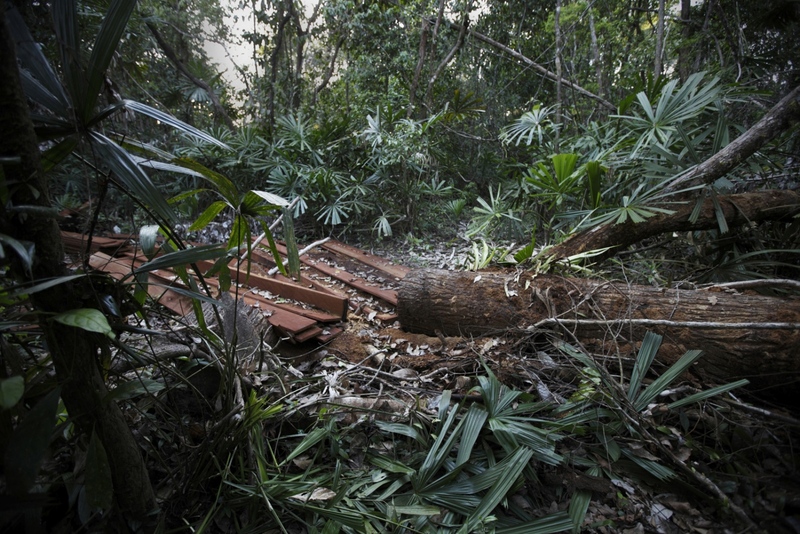 Vast areas of the forest are being encroached upon in this way. 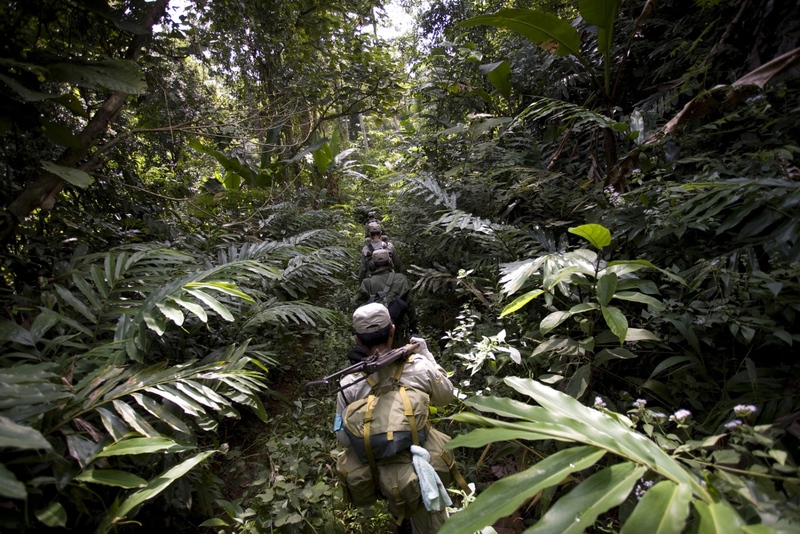 Forest rangers on patrol in the Samkos Wildlife Sanctuary. 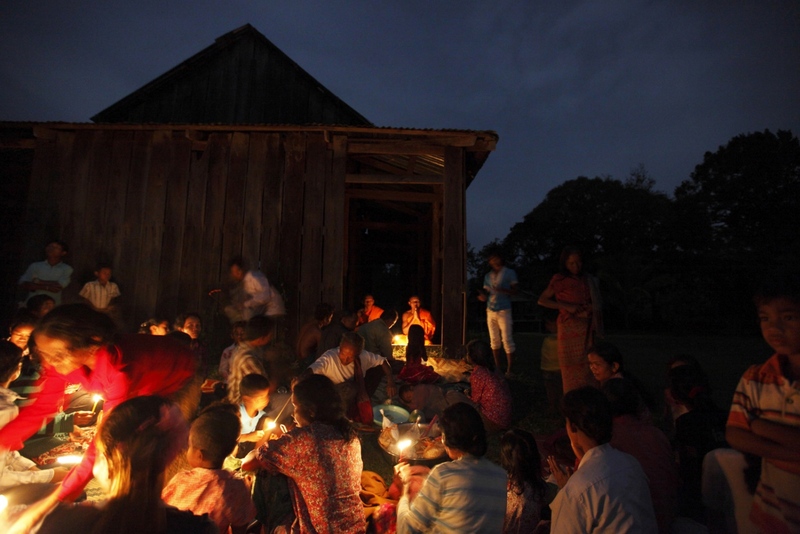 Local people of Prolay village in the Areng Valley take part in a traditional anual ceremony at their local temple. 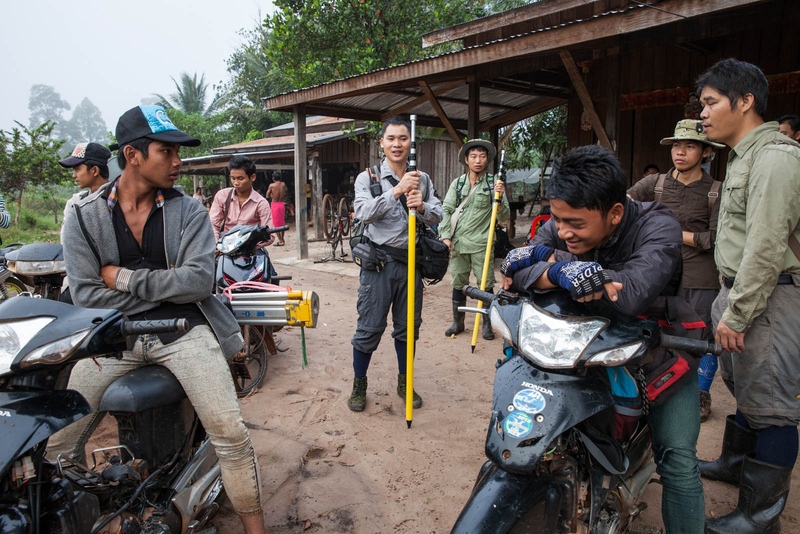 Members of the Cambodian military stop for a rest during a raid on some illegal sassafras oil distilleries. Sassafras distilleries that produce the oil from rare Mreah Prew Phnom trees have become a real problem in this area but difficult to stop due to the remoteness of the forest and the high demand and profitability as the oil can be used as an ingredient for the drug Ecstasy. A large patch of forest clearer to make a sugar cane plantation. 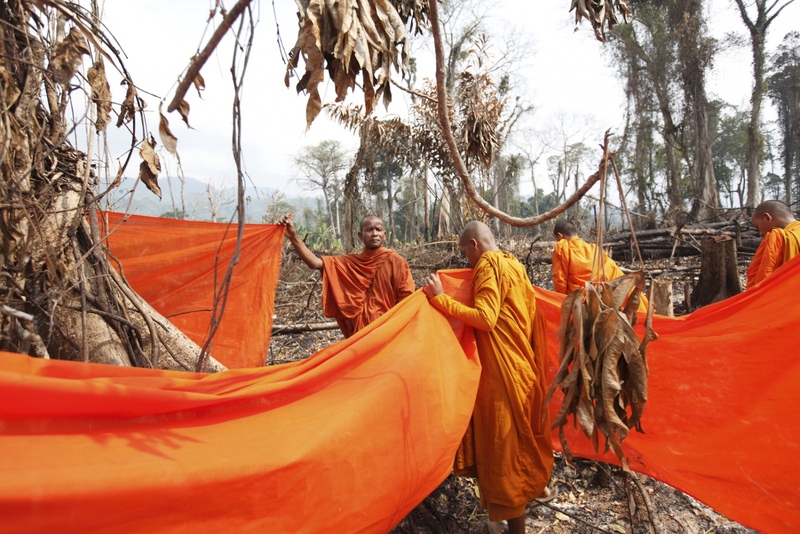 Cambodian Buddhist monks and local people bless large trees by wrapping orange cloth around them and praying. Following uncontrolled forest destruction in the Central Cardamom Protected Forest (CCPF) an eco-warrior monk movement has begun whereby monks and villagers try to protect areas of forest by blessing trees to deter would-be loggers. A lone tree stands during a misty morning in the Areng Valley. 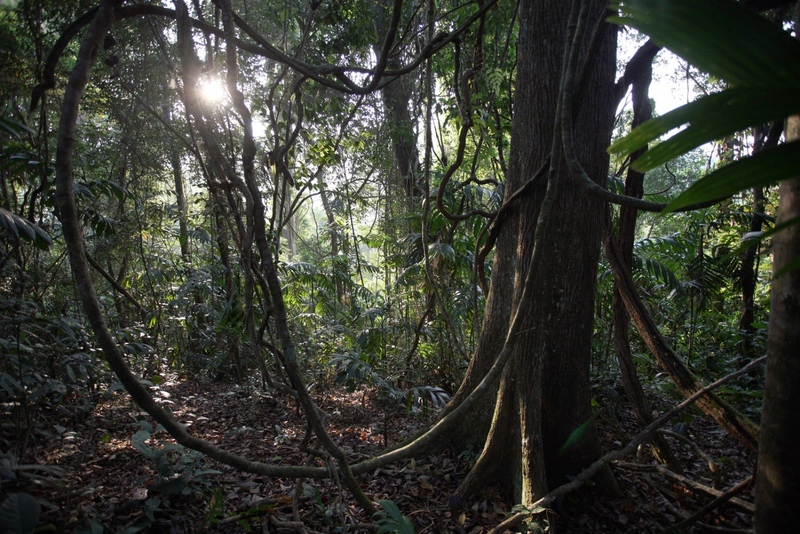 The Cardamom Mountains remains one of Southeast Asia's last great forests. 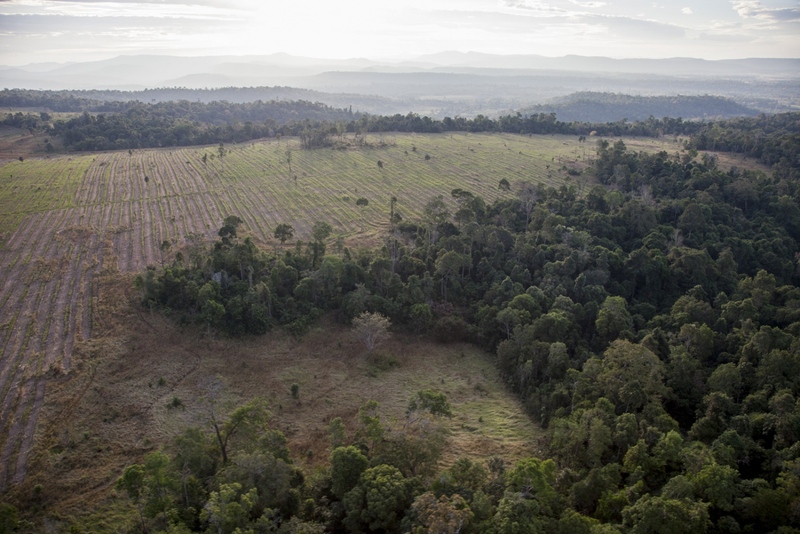 One of the largest and most pristine areas of intact forest in Southeast Asia it covers an area of 2.5 million acres in Southwest Cambodia. The edge of this great forest formed one of the last strong holds of a retreating Khmer Rouge, who's presence helped preserve the forest as no-one dared to venture inside. 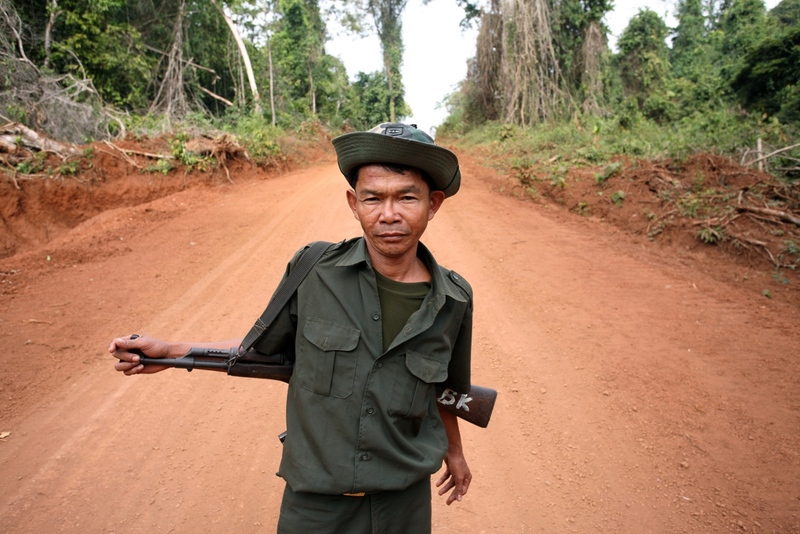 But with the Khmer Rouge gone and as Cambodia has opened up the forest has faced new dangers from all angles despite the allocation of Nationa Park status. Land enchroachment, poachers, illegal loggers, hydro-electric dams and even illegal drug distilleries have all been chipping away at its peripheries over the years and now venture deeper and deeper. 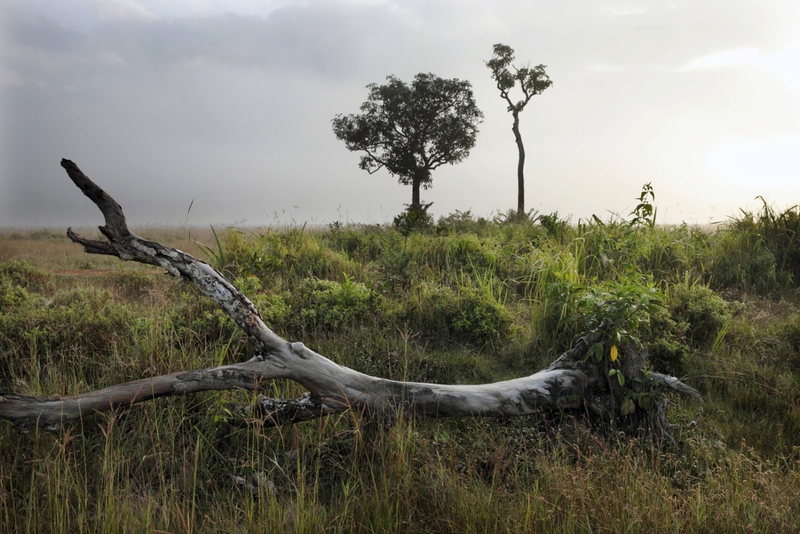 How much of this great forest will be lost before real protection can finally save it? 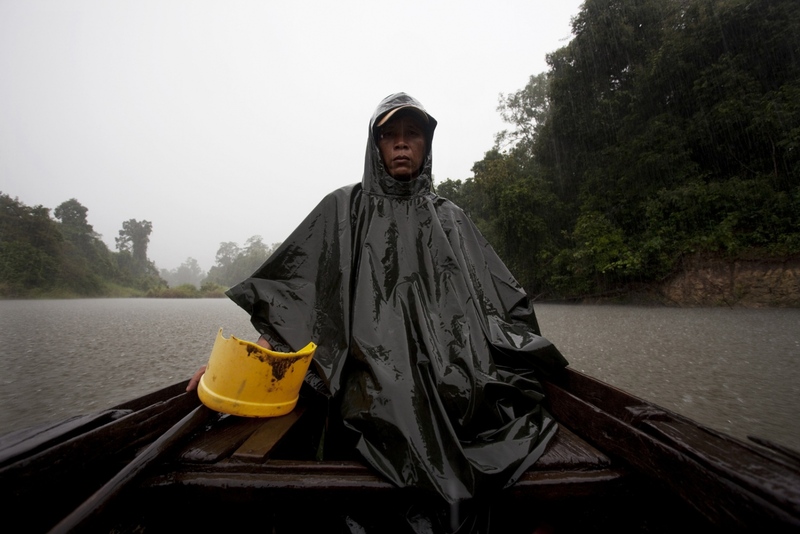 Over the last 5 years I have travelled in to the Cardamom Forest to work on various stories ranging from the conservation of the Siamese crocodile, tracking down of illegal sassafras oil distilleries by forest rangers to a Buddhist-monk lead movement trying to prevent the construction of a ill-thoughtout hydro-electric dam. 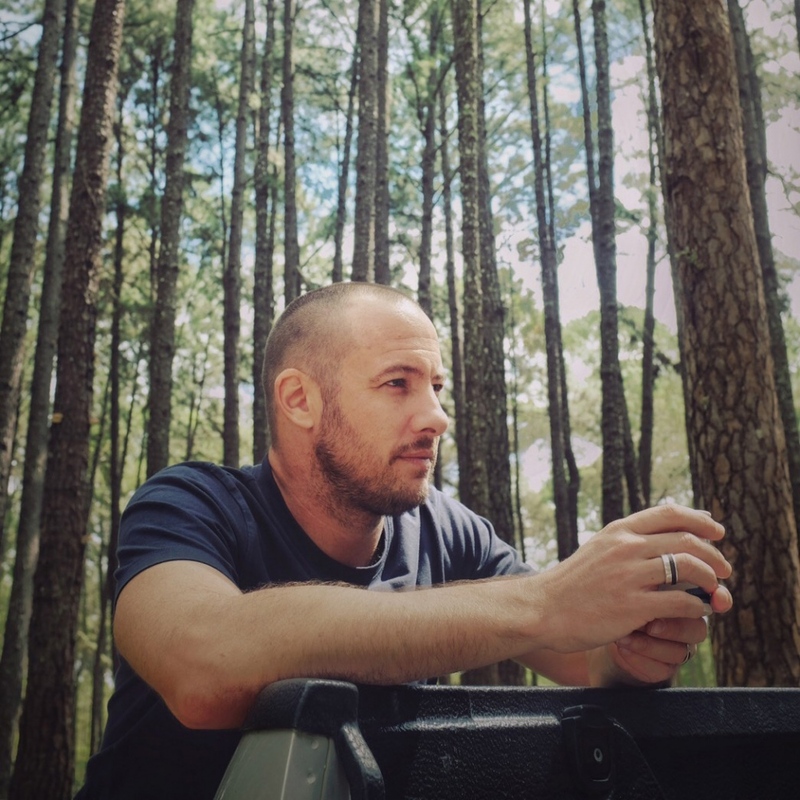 This gallery shows a selection of my photographs from these trips. By Luke Duggleby — The 300km long Kohistan-e-Namak mountain range in Northern Pakistan is home to one of the largest deposits of rock salt in the world. Six large..